The challenge of introducing social media to the workplace is one that a number of companies have taken on, but few have really met. Sure, you can essentially rearrange Facebook and apply it to the workplace, but the basic problem with that is that most employees (translation: I) don’t necessarily want to hang out with their coworkers online, which is what social networking sites like Facebook and Twitter are all about. They (I) want to be able to communicate and collaborate on work-related projects for the sake of productivity without committing to being virtual besties. One company, Tibco, may have gotten it right with the launch of its own enterprise social media platform, tibbr, back in January, and today, the company is announcing a new upgrade: tibbr 3.0. The difference between tibbr and other enterprise social media platforms like Yammer and Salesforce Chatter is the fact that tibbr allows users to follow subjects rather than people. You may not know the dude in Clearing and Forwarding that you need to connect with to find out the status of a shipment, but with tibbr, you can check the relevant topic and find out whether the shipment is on time, delayed, etc. The new and improved tibbr 3.0 adds a few new capabilities to the original tibbr platform, including HD video conferencing and desktop sharing. One of the tibbr 3.0 additions includes tibCast, an HD video conferencing feature that allows users to initiate voice calls, video conferencing, or desktop sharing with a single click directly within their tibbr stream of interactions. Additionally, Tibco has added a new feature that allows users to not only follow a stream of activity, but to act on it. For example, if there was a meeting that you weren’t able to follow, you can now check out the automatic recording of the meeting and, if you have further questions, you can instantly initiate a voice or video call by clicking on the name of one of the attendees, all directly within tibbr. Document management is another important area of everyday enterprise needs, so the new tibbr 3.0 allows users to search for, access, share, and archive documents all directly within tibbr. Another new feature being added to the tibbr offerings is tibbr Communities, a new platform for allowing enterprises to create, manage, and monitor multiple communities while maintaining privacy for different users. Employees can engage in multiple communities from a single login and rest assured that they’re sharing the right information with the right people. 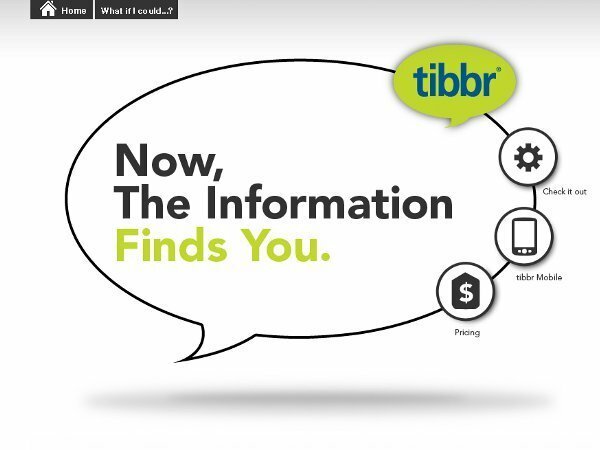 When Tibco unveiled tibbr in January, the service launched with 40,000 users. Today, tibbr serves 20 customers and, in Ram Menon’s estimation, a “couple hundred thousand” users. Real-Time Visibility: The power to see what's happening right now across their operation and marketplace. Real-Time Understanding: The power to make sense of it all so they can understand the impact of developing situations. Real-Time Action: The power to act and adapt so they can immediately seize opportunities, mitigate risks and proactively maneuver around threats. Together, these capabilities add up to real-time business and give companies what TIBCO calls The Power of Now: the ability to sense and respond to changes and opportunities as they arise.